vcFlow is shown as a plugin for Atom. It enables visualization of variables as well as the time-based flow of the code. vcFlow is inspired by programmers needing to better understand the runtime behavior of new codebases that they deal with. From a mechanistic view, vcFlow is inspired by in-situ visualization and event-sequence visualization paradigms in the data visualization field. vcFlow annotates code to show which parts are running at runtime. It also visualizes variable values through time. A programmer can interact with their program and observe which parts of their codebase are running and how correct/wrong the variables look. I built vcFlow with a client-server architecture and by utilizing Python's system trace capabilities. 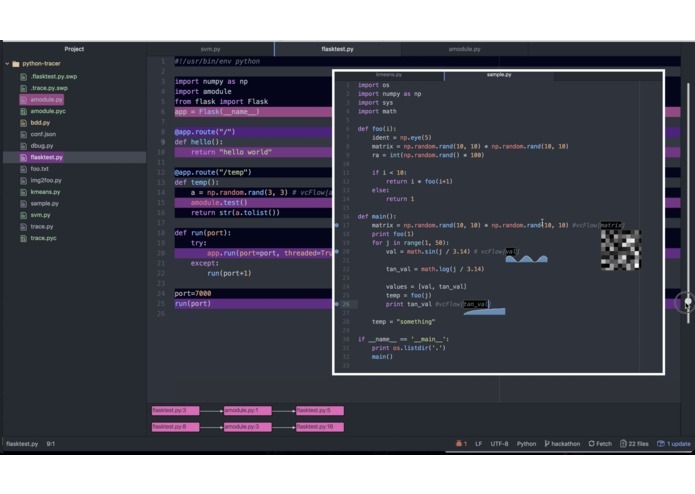 The server-side runs in the background and sends runtime information to an editor (Atom) for visualization. Because vcFlow essentially runs as a remote code-tracer, debugging vcFlow itself was somewhat difficult. I decoupled different parts of the code and tested them separately. Deploying vcFlow as an installable Atom plugin and the simplistic architecture are the two main things I like about this work. I learned working with Python's runtime objects such as frames. That was fun. I plan to add a more featureful syntax for describing what visualizations the user can have for a variable. I would also like to experiment with adding support for a language other than Python.